GoFundMe is the #1 and most trusted leader in free online fundraising/crowdfunding. Since 2010, we have helped people in over 170 countries raise more than $5 billion. 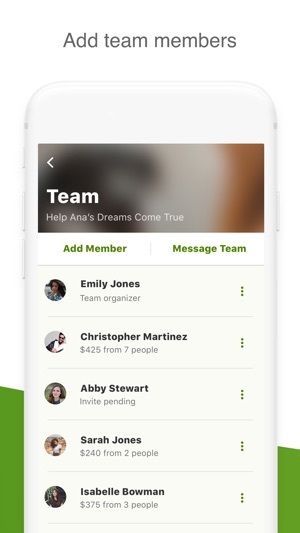 Start or manage fundraisers, engage with supporters, and discover important causes on the go with the GoFundMe app. Medical: From ER visits to long-term care, medical expenses can wipe out savings accounts and leave behind debt that lasts for years. Medical crowdfunding is a powerful tool that can help people conquer medical bankruptcy and focus on healing. Countless people have found that using GoFundMe for medical expenses can help pay for prescriptions and doctors visits—as well as procedures not typically covered by insurance. Animals: Your pet’s presence is woven into the fabric of your everyday life. That’s why when your pet goes missing, falls ill, or needs emergency surgery, it can shake your foundation and leave you feeling anxious about the future. Crowdfunding for pet expenses can ease financial burdens and allow you to get your pal the help they need, right when they need it. Memorial: When you’re grieving the loss of a loved one, you shouldn’t have to worry about how you’ll pay for a funeral. Crowdfunding for funeral expenses helps ease financial stress during this difficult time and allows you to focus on saying goodbye and honoring your loved one’s memory. 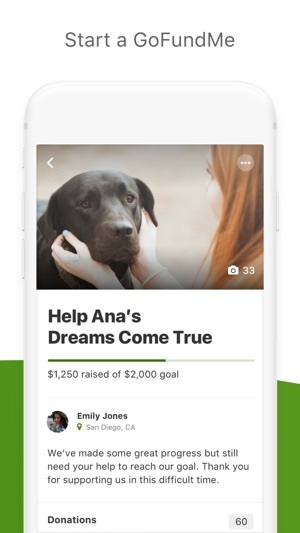 • Raise more, keep more: GoFundMe’s 0% platform fee means that you get to keep even more of the money you raise. • Get started in minutes: Set up your fundraiser with photos and videos, share with supporters, and start accepting donations in just a few simple steps. 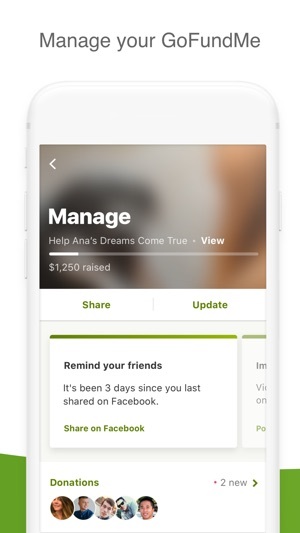 • Stay in the know: Never miss a donation or important update about your fundraiser with timely app notifications. 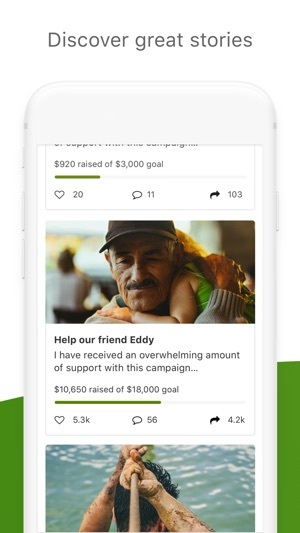 • Post updates: Record and share video updates within the app or simply post photo or text updates to let supporters know about your fundraising progress. • Set up withdrawals: Withdraw funds directly to your or a beneficiary’s bank account, and receive money in just a few days. Education: Education is the fastest growing category on GoFundMe, and it’s no surprise: We know that teachers, schools, and students can always use more support. Donate to individual fundraisers that allow teachers to purchase classroom supplies or even help to send a deserving student to college. Charity: Creating a fundraiser through GoFundMe is the best way to raise money for a charity you’re passionate about. Thousands of people are raising funds for a 501(c)(3) nonprofit, and you can support their mission to make a difference. Emergency: When disaster or tragedy strikes, people turn their compassion into action by starting fundraisers to help the victims and their families. You can donate to an individual fundraiser during these times of emergency to make a direct and immediate impact. • Discover fundraisers: Search for people and causes that matter to you, read inspiring stories of people helping others, and donate or share to make a difference. 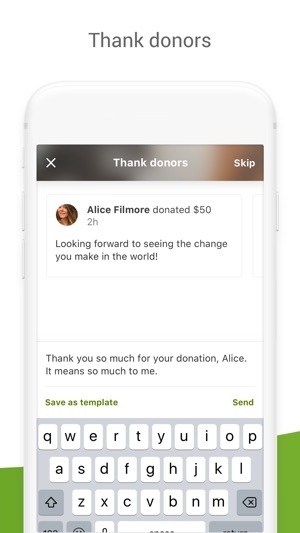 • Receive updates: Never miss an important update or response to your donation with timely app notifications. • Donate with confidence: With GoFundMe’s first and only donor protection guarantee in the industry, you always know that your donation will go to the right place. We’re constantly working to provide you with an even better experience through the GoFundMe app. - Share fundraisers on Snapchat! - Various bug fixes and performance enhancements. My family wanted to raise money for my sister's husband and children after my brother-in-law was diagnosed with terminal brain cancer. We researched several sites and decided that Go Fund Me was the best. At first, we were concerned about the small percentage taken from each donation, but we realized that all of the sites do this but just aren't as up front about it (they have the donors add to their donation to cover the credit card fee). Go Fund Me is easy for me and the donors. It's very easy to share with others and is the most trusted to manage the money raised. My page has been shared over 3.5k times on Facebook with over 500 donors. Just a few days ago, we received a donation from the Go Fund Me team for $1000. They emailed and said it was part of their 'Give Back' program and said our story touched them. Go Fund Me truly cares about raising money for great causes and I believe we couldn't have done it without them. Thank you! “Come together right now.” Love GoFundMe. I have donated previously through Go FundMe and it was a smooth process. Was glad to be able to come to the aid of a complete stranger! I greatly love paying it forward & that’s exactly what this is all about-supporting & caring for your fellow man-“Love Thy Neighbor.” I just recently had to set one up for my sweet little brother who was terribly injured in a recent car wreck. It’s nice to know that there are so many caring souls out there & my brother is not forgotten & is loved- even by those he has never met! We are a very blessed society to have such a platform. This has been an overall great experience all around & thanks to the kindness & selflessness of others my brother will be able to get better care & hopefully a stellar rehab for a quicker recovery process! Thank you Go FundMe & all of you Earth Angels for making this possible. I love all of you from the bottom of my heart and beyond!!! This app is user-friendly with details that enhance the experience. For instance, updates with photos help to communicate to your audience. It is a little challenging at first to figure out the differences between sharing tools and it doesn’t manage to whom you have or haven’t sent the link. I received messages that I hadn’t shared on Facebook for days, when updates actually go to Facebook. Also, videos are challenging because you can’t link a previously shot one. The fee is reasonable at 3% with a 30 cent charge per transaction. The withdrawal process is very simple and once established, continues without updating. And there is a thank you template that once written can be used and adapted again and again. So while there are a few kinks, the overall system is brilliant and helpful toward the intended purpose.